If, when you hear the name, Steve Martin, you think Bringing Down The House, Cheaper By The Dozen 1 and 2 and The Pink Panther remake then I feel sorry for you. Martin is one of the great comedic performers of the last few decades. The only problem is that most of his best work was produced a few decades ago. Which brings us to Dead Men Don't Wear Plaid. What a good, fun movie this is. The film is an homage/parody of the old classic film noir movies from the 50s with Martin playing, Rigby Reardon, the detective and Rachel Ward playing the love interest, Juliet Forest, who comes to Reardon convinced that her fathers death was no accident. The film has all the wonderful tropes of classic film noir, including: The voice over, the mystery, the classic cadence and style of the dialogue, being filmed in black & white and the actual actors from many of those classic film noir movies we all know and love. The film uses footage from a bunch of old movies integrating those scenes and characters into the current film. You got Humphrey Bogart, Cary Grant, Barbara Stanwyck, Bette Davis, Ingrid Bergman and more. It might sound a little gimmicky, but I have to tell you I thought it was great. If they’d only done it for a couple scenes, then it would’ve been a gimmick. But we’re talking 10 or more scenes here, and they are worked really well into the plot. Being a fan of film noir, I guess I might have enjoyed it even more then those who are not as familiar or interested in the genre - and it became a little game trying to place the actor and the movie from which the clip was taken (at the end of the movie they list them all so you can go 'oh yeah, of course' over and over again). 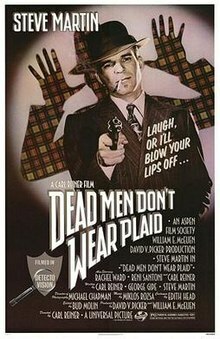 Dead Men Don't Wear Plaid is a fun, funny film that, along with other movies Martin made in the 80's, show us why he is so well regarded - in case you’ve only seen some of his more recent work from the 2000s and just didn't get what the big deal was.